For the longest time, besides family, black people would only put three pictures up on the wall: Jesus Christ, Nipsey Russell and John F. Kennedy. The Kennedys, in general, have always had a soft spot in the hearts of many black folks because they have always been, as old timers say, "good white folk." The kind of white person you didn't have to worry about giving you the soul handshake (WTF? ), talking black jive to get along or dropping the "N" bomb by accident. They were the kind of white people who are at ease with everyone; white people you could have over to dinner. The Kennedys as Irishmen, knew how it felt to be marginalized and, despite their wealth, this marginalization seemed to inform the politics of the whole family. The passing of Edward "Ted" Kennedy last night doesn't just leave a gap in the Democratic Party. Who will bring his empathy and compassion for the rest of America? Who will take up his causes? John, Robert and Ted were different men with seemingly the same directive: to make America's dream accessible to everyone. John, Robert and Ted Kennedy seemed not to be just pandering politicians, but officials who people of color could trust to listen and respond, to act in the interest of people struggling to grasp a hold of the American Dream; to acknowledge everyone as stakeholder and not dismiss The Others as irrelevant. The Kennedys seem to value compassion as an essential human virtue and walked the talk in ways uncommon for politicians of any stripe. They didn't wear their whiteness with authority — they were big on playing the human card and left matters of race and class to be argued by the pundits. Ted Kennedy wanted a more perfect union and was willing to fight for it. When he cosigned Barack Obama last year, Ted Kennedy helped assuage a lot of fears among white and black Americans: his "ups" signified to many that Obama could be trusted to uphold what was important to this country. Ted Kennedy was not a perfect man by any stretch, but he was the kind of white man you sometimes find at black barbecues and barbershops, enjoying a drink, a plate or a laugh. The only white man at your wedding, the only white person your grandparents ever let in the house because he was at ease. He was at home. He left his burden of privilege at the door. You know who I'm talking about — Ted Kennedy was that dude. Brother Kennedy: Good White Folk. 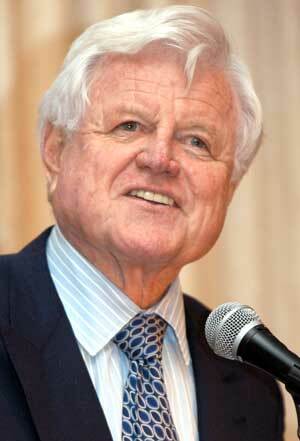 Now that Ted Kennedy has passed, who has the gravitas, the compassion and the credentials to take up his mantle?